Learn how to do the coin bend magic trick from celebrity magician Matt Wayne in this Howcast video. Here&apos;s a great trick that you can do with a borrowed quarter. All you have to do is borrow a quarter from someone, put it in your hand, and you&apos;re going to show them that you have superhuman strength by rubbing on that coin. Just rub, rub, rub, rub, and push down on the coin, and then, hopefully, you&apos;re able to cause that coin to bend. Here&apos;s the explanation behind the coin bend magic trick. All you need to do is borrow a coin from a friend and, before you borrow the coin from a friend, you have to make a bent coin up yourself. Here&apos;s a very impromptu way of doing this. Grab a hammer, take a coin, preferably a quarter. Go outside and, the pavement cracks in between the cement, stick the coin in one of those cracks. Take the hammer and hammer down on top of the coin. That coin, as you hammer it, will start to bend in half. It&apos;s a very impromptu way of bending a coin. Now if you have access to a vice, you&apos;re more than welcome to do it that way. Just turn it in the vice. Make sure it&apos;s nice and tight and then hammer it that way. But not everyone has a vice or a work shed, so you can go outside and make it by using the pavement. Now that you have your bent quarter, you&apos;re ready to start the trick. Place the bent quarter on your middle finger and it will be nice and clipped because of the bend. Show the quarter to your audience. Come in. As you come in front of the coin, you&apos;re going to drop the quarter, but replace it with the bent coin. Like that. And you say that you&apos;re just going to start lightly start brushing the coin with your middle finger, like that. As you do, you can make some sounds as if you&apos;re pushing on the coin, a grunt or whatever you&apos;d like. When you&apos;re done rubbing, just remove your finger and show that the coin has bent. 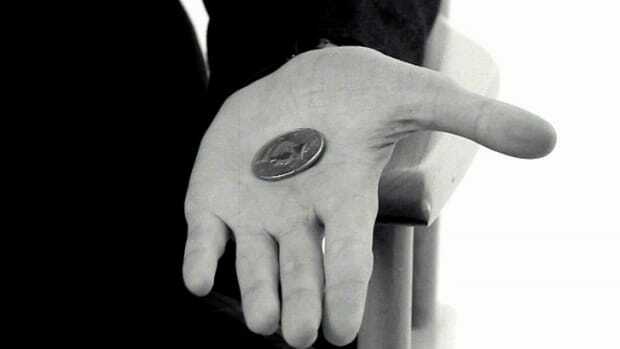 As a bonus, if you&apos;d like to show your friends that you have some psychic powers, you can then give the illusion that the coin is bending by holding it between your thumb and forefinger. If you push the coin up, it will naturally bow outward. And it&apos;s a perfect illusion, if done right. And I highly recommend practicing it in front of a mirror. As you say the word, "bend, bend, bend, bend," you push that coin up into view and it will give the illusion the coin is bending even further. I hope you have fun with the coin bend magic trick.